The traditional trophy scrum is just the start of what’s going on during these moments, and one of the easiest and most obvious to shoot. A happy moment that was over in about three seconds: Menee Thomsen congratulates Kenzie Dean after the Lady Cougars won the area championship game. 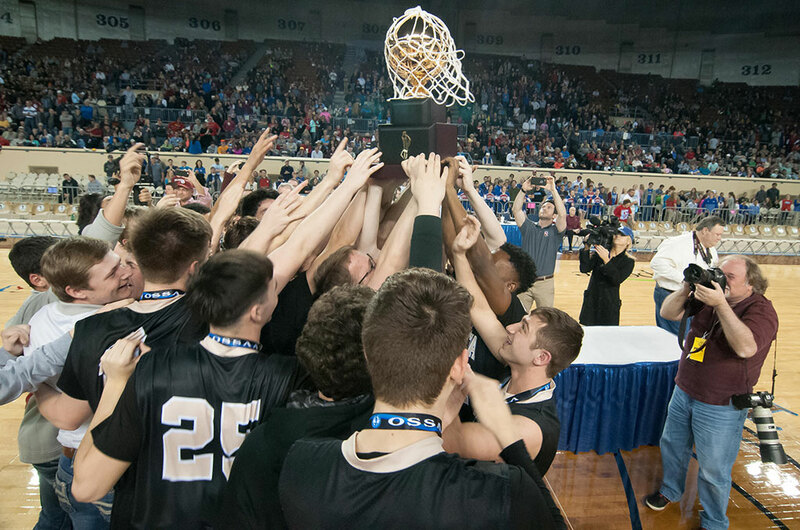 My newspaper and I recently covered the Ada Lady Cougars area and state tournament basketball playoffs and the Latta Panthers drive to the state basketball championship game in Oklahoma City. I remember quite vividly as I was working the most important aspects of these events, their dramatic climaxes, that I was only thinking about one thing: how to get the moment. I wasn’t thinking about shutter speeds or apertures or pixel counts or how to set exposure compensation. All those things were happening in the background of my mind. In the foreground were the faces I’d photographed all season long, and the people behind them who were experiencing the best or worst days of their young lives. 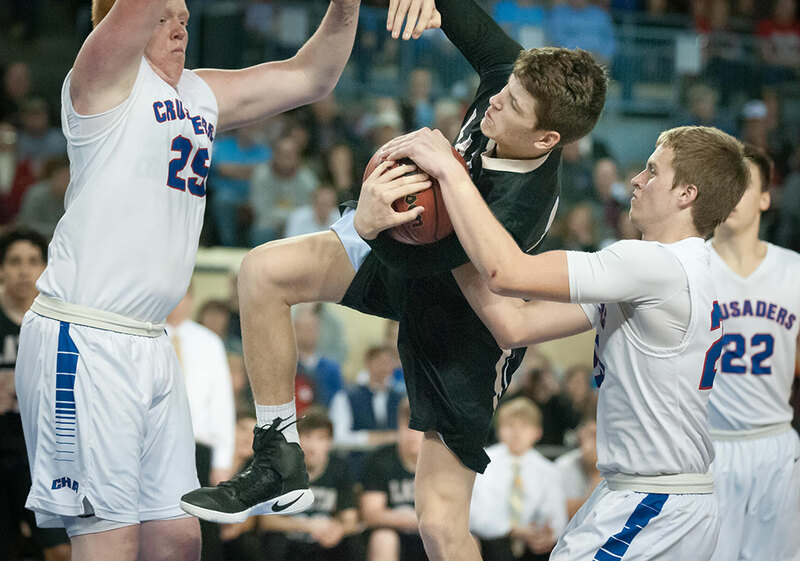 I had my camera at “low ready” with my eyes on the game when I saw this kid charge the basket. I was ready, and shot this without even thinking. My point is, of course, that we need to be prepared. Plan plan plan. And don’t just plan to have the right gear in your hands, plan to be in the right place. Plan to be comfortable with your exposure settings and white balance settings and ISO settings long before the moment starts. 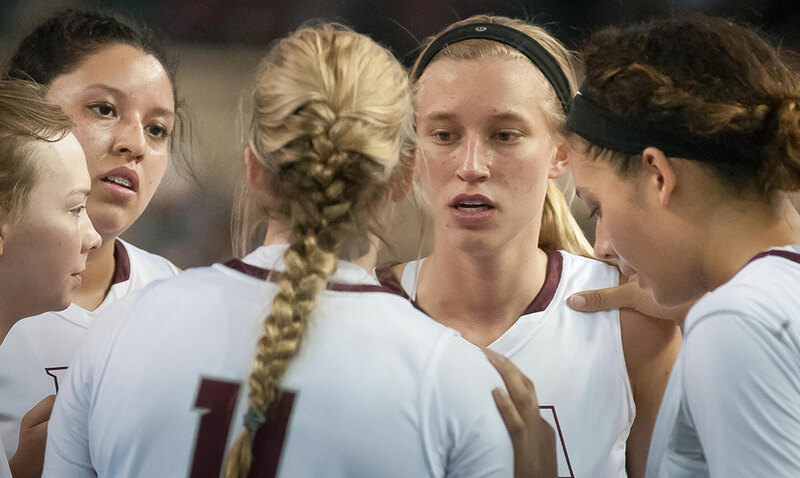 A tough moment: the Ada Lady Cougars reassure each other as their state tournament hopes slip out of reach. If it’s 13 seconds before the end of the game and your team is either about to leap into a dog pile or bury their faces in their towels to hide their tears, and you are trying to decide if aperture priority is better than shutter priority, you aren’t ready. Now is the time to get ready. If your tenth grade daughter is slated to start for the softball team in September, now is the time to go to softball field and shoot, then sit at home and realize everything you did right and everything you did wrong, and decide now how to fix it. 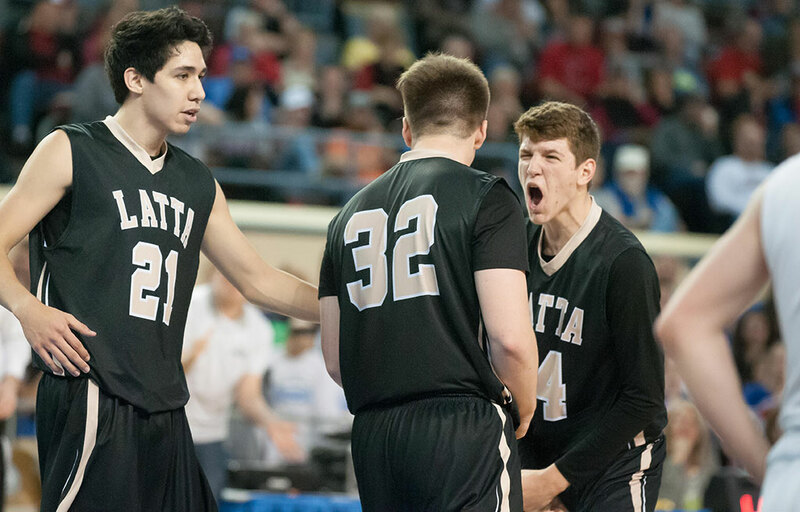 Another fleeting moment: with just seconds left and their state championship win assured, the Latta Panthers can’t hold back their emotions. When you are comfortable rolling in +0.7 exposure compensation without really looking, based only on a glance at the monitor… when you are comfortable switching from the camera with the wide angle on it to the camera with the telephoto on it… when you are ready to imagine what is going on in the hearts of the winners and losers of those games instead of what’s going on inside yours, you might be ready. Part of being read to make pictures is being ready to shoot the hard ones along with the easy ones, like this stressed-out moment for coach Christy Jennings as her team struggles to come from behind in their area championship game. A most worthy snippet from miles and miles of experience. If this was a 100 page treatise I’d read it.